Saucony Peregrine 5 are neutral trail running shoes. 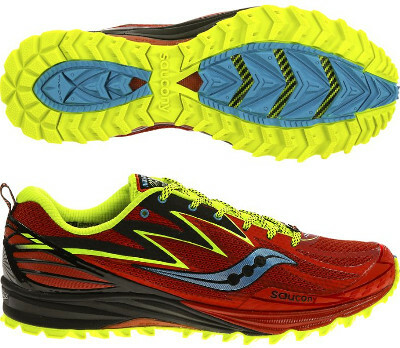 The Saucony Peregrine 5 updates the lightest trail running shoe from the american brand. Although official specification states 4 mm drop, Runner's World test unveils almost 8 mm offset between heel and forefoot, take it into account. This model targets both neutral and mild pronation runners looking for a great balance between protection and lightness. Check availability for Gore-Tex version. This new version keeps the great outsole from its predecessor the Peregrine 4 and just the upper has been changed: rubberized Toe Tip for durability and stronger protection, traditional eyelets for better fit and plastic counter heel for improved support. Breathable mesh features lightweight synthetic materials (FlexFilm) and gusset tongue prevents debris from entering the shoe. In order to protect shoes from rocks and stone bruises without rigidity there is an External Bedrock Outsole (EBO) in the midfoot and a nylon fiber mesh rock plate in the forefoot. The midfoot's one also provides moderate pronation support.